Highly anticipated as a replacement to its world-renowned Hempadur 15400 tank coating, leading marine paints manufacturer Hempel has announced the launch of Hempadur 15460. This high-grade product has been specifically designed as a tank coating for chemical vessels and is based on amine adduct cured epoxy technology. This delivers outstanding resistance to continuous immersion in a range of chemicals, including crude oil up to temperatures of 80ºC/176ºF. • A two coat system, which reduces expensive application times. • Higher volume solids with reduced solvent emissions. • Low cargo absorption and retention meaning quicker cargo turnaround and greater flexibility. • Higher cross-linking density giving improved chemical resistance. Developed specifically with customer requirements in mind, Hempadur 15460 incorporates a high cross-link density technology, which creates an internal matrix giving added advanced chemical resistance and low cargo absorption and retention. In addition, this new pure epoxy tank coating exhibits a high glass transition temperature (known as Tg) that provides high temperature resistance, improved abrasion resistance, extended maximum recoating intervals and a hard, smooth and glossy surface for easy cleaning. Hempel’s global product manager Michael Aamodt says: “To deliver the best results, we need to constantly challenge ourselves and our products. 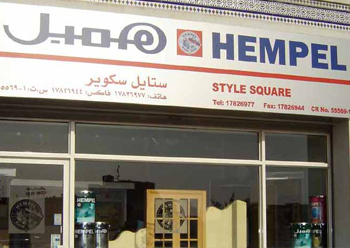 Hempadur 15400 is a great product, but to meet our customers’ needs for greater protection, added flexibility and reasonable price, we developed Hempadur 15460 as a high-grade replacement. “This new tank coating is FDA compliant for the carriage of liquid foodstuffs and has been developed specifically to resist all oil product cargoes including clean petroleum products (CPP), dirty petroleum products (DPP), crude oil, benzene, ketones, fats, and caustics. Hempadur 15460 uses no toxic products and can be used to coat all liquid cargo tanks. It is also suitable for grey and black water tanks, mud and brine tanks, refrigerated seawater fish tanks and other vessel tanks.